Children from birth to three years old who are experiencing developmental delays can receive free services through BabyNet regardless of income. Many parents of children are surprised to hear this and have never heard of BabyNet. BabyNet provides free services to all children from birth to three who are experiencing delays. These delays include speech and swallowing (speech therapy), motor skills (Occupational and Physical Therapy) and/or any other delay in their developmental milestones (Early Intervention). Hi, my name is Ann Marie May and I am a Speech-Language Pathologist. 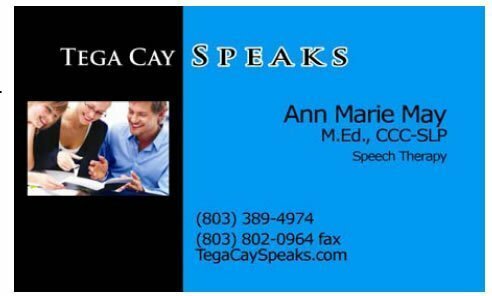 I own a company called Tega Cay Speaks, LLC. In October we will be opening our business in the BW Thomas Building in Tega Cay. My company Tega Cay Speaks, LLC contracts with BabyNet to provide services to children from birth to three who are experiencing developmental delays. We currently provide Speech Therapy services, but will also be providing Occupational Therapy services soon. We hope to provide Early Intervention services in the near future as well. If you would like to know more about BabyNet or would like to have a free screening to see if a referral to BabyNet is necessary, please call me at 803-389-4974. I would love to help you and explain the BabyNet process in further detail. We also provide peechlanguage services to older children and educational enrichment services such as reading on grade level. I must say I haven’t heard of it either. Thanks for posting this info, I’m sure this would come as a benefit to many people who have no idea this is an option for them.